I got mine a while ago and hadn't test it until now and it doesn't seem to cover the whole 180 degrees, its more like 160. Is it like this or is mine defective? Mine is the same, although it doesn't have that sound. It does, however, only go about 160. Same here. It also makes an horrible sound when I'm trying to position it to 0 degrees. I assume the stoppers are not correctly placed. I just got one and see the same two issues. It looks to be more like 135 or so and yes if I send a 0 position to it it hums. Here is what I found out with this servo. This should be removed from the description. No datasheet for this one? Hi, I never used servomotors before. What control voltage do they need? Can these be used with a microcontroller which has a 3V power supply? Here's a basic tutorial for working with servos on Arduino. You will need to use a power supply that's appropriate for the servo you decide to use. This one requires 4.8-6V so it wouldn't work on a 3V system. Can this be used outdoors? Also what is the operating temperature range? I just tried backdriving one of these and heard a little snap. I opened it up to find that a tooth had broken off of the gear driving the pinion. Turns out, the teeth on the pinion gear werenât cut all the way through, so this thing couldnât even turn! QC anyone? is it possible to provide same signal to the white wire of 30 different motors so they can do the same movement? anyone? thanks. What are the optimal values for setting the min and max position? I'm referring to the command: myservo.attach(9,MIN,MAX); // use pin 9, set minimum to MIN [us], set maximum to MAX [us]. How much current do these draw at 6v? I need to know what size resistor to use with a 9v supply. Hi all, so I bought 2 of these alogn with the pan and tilt bracket. Couple points: 1. These will work connected directly to the Arduino, though I suspect it's best to use a motor/servo controller board for more than just a quick kludge to verify things are going to work. 2. SparkFun guys: the mbed example might not be the best example to jsut see the servo's moving. Using the example "sweep" from the Arduino site instead might make good sense: http://arduino.cc/en/Tutorial/Sweep. I followed this and was watching the servo's move in less than 5 min. 3. running the servo's with the sweep program for > 1 min or so, so continuous motion, get's them warm and I think had I let them run longer I'd have eventually burnt them out. You guys think maybe going through a servo controller would do better with the heating issue? It's really hard to know exactly how to work with these with out something more than just operating voltage , I think. I'm not a EEm but but without a data sheet it's really hard to consider putting these into a bot or device if you expect it to be predictable. Am I wrong? Is there a technique I'm not aware of? Any chance of getting some specs regarding the operating current? My servo does a really strange thing. I have an AtTiny45 sending out a PWM signal (20 ms, with the high time varying from 1 to 2 msec and then back again). I measured it with my oscilloscoop and the AtTiny works. The high time goes up from 1 msec, to 2, and then back to 1 (in 8 steps, like I programmed, no special reason for those 8 steps, just a test program, I have the AtTiny do a _delay_ms of 500 ms between each step). However when I connect the servo to it, the PWM signal is constantly being pushed back to 2 msec high time. Sometimes it goes back to something like 1,7 msec, sometimes 1,9 (completely random) before it jumps back to 2 msec. I have a more than sufficient power supply, I measured the voltage line also, it's a stable 5V, even when the servo is turning. Don't know what the problem could be..
What is the maximum current of this one? Can I connect this one to the 5V output of a Netduino or should I get a voltage regulator along with this? 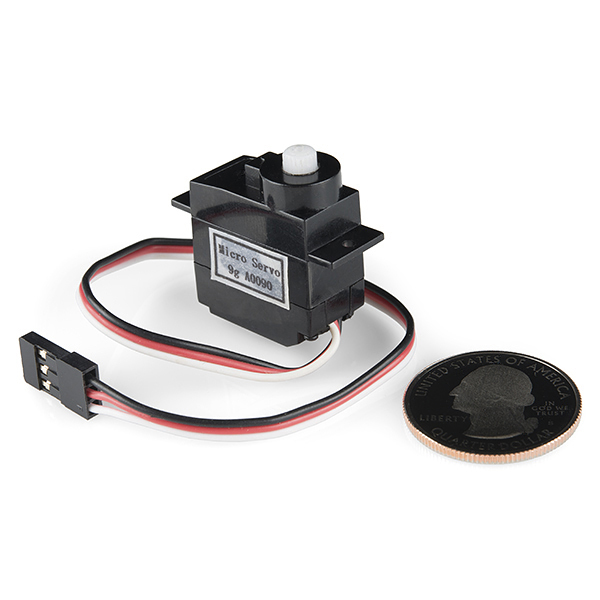 This is my first servo purchase and I am just curious how I would figure out what is the resolution(smallest rotational change) that I can expect from this servo? I am familiar with PWM and all that I just want to start thinking of the design of my servo drivers. I imagine that I could empirically figure this out with the IDE debugger and some inputs to control the PW. Any suggestions would be appreciated. Thanks! Did you ever figure out the resolution of your servo? Hey guys. Can you let me know what the gearing ratio is for these motors? I've been trying to get this servo to work with my arduino, but it doesn't move besides a little jerk when I first apply power. Thinking perhaps I broke it, I bought a larger servo and hooked it up, and I'm still having the same problem. It simply doesn't work. I'm using the example programs for the Servo and PMWServo libraries. I'm using a wall wart to provide separate power for the servo. I've tried both 4.5 and 6.0V supplies. I've got ground going to black, power to red, and control pulses to white. help, i cannot operate this servo. i have this in a loop and it only jolts 1ce, then not even resetting makes it work again, only re-uploading the code or removing and re-applying power. That depends on a lot of factors. Check the torque rating above and then decide your lever arm, etc. when is it gonna be back in stock?i need it to checkout!!! We had an issue with our shipment that we're working out. It got caught up in customs and we don't have an ETA as of right now. I am quite pleased with this servo. I use it to pan a sharp infrared sensor back and forth. It operates at 5 volts and works fine with my arduino. It is quite fast and docent make much noise. Overall it is a nice servo for what I need. Hi I think the features for output torque should be 1.4kg-cm (not 1.4kg/cm) or have I missed something here? No. Torque has a base unit of Newton meters, or in this case, kilogram centimeters. In either case torque is represented as force x distance. 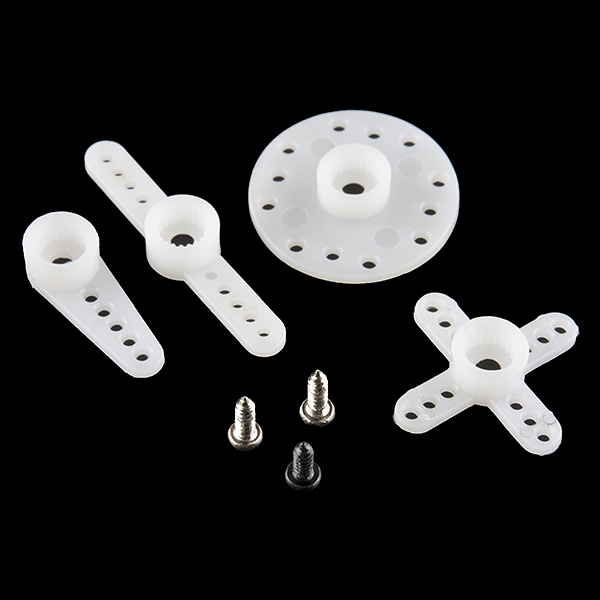 The way to think of it is that this servo is specified to apply a force of 1.4 kg at a distance of 1 cm. You can scale this too. If you need say, twice the force out of this servo, you should connect your driven component at 1/2 the distance from the center of the drive shaft. Conversely, if you drive something from 2 centimeters out from the shaft, you will only get 0.7 kg of force. Well then you should probably contact techsupport@sparkfun.com. I've got it mostly working now. I'm having trouble finding stable values though. 0.5ms and 1.25ms work, but none of the others I've tried do, including 2.0ms. Does anyone know what values work with this servo? I can't get this servo to work! I have: Red = 5V, brown = GND, Yellow = signal. I'm sending a 50Hz PWM signal with a 1.25ms hi time. However, every time I send the servo a signal, it just turns clockwise instead of moving to a fixed position. Any suggestions? The servo turns only to about 170 degrees. It reaches 90 in one direction,then only 80 in the opposite way. Is there a way to achieve a full 180 rotation? I get this problem as well, if I increase the range above 0.0008 it just spins continuously (which is actually quite useful if I ever want to use it as a simple motor)... but not if I want to use it as a servo! Any ideas Sparkfun people? I, too, have a servo that has a range of approximately 170 degrees! For me, this isn't a big deal, I'm just dialing down the range when programming so that I don't overturn/overheat the thing. This servo locked in less than 12 hours. Not impressed with this servo...one of the nylon gears stripped after less than 5 minutes of running time. The applied torque was much less that 1.4kg/cm, it was just flicking an ordinary lightswitch on and off. Haven't tested it in my dif drive bot design yet, but it looks like it will work. Wrote a quick tutorial on modifying these for continuous rotation on my blog. Your instructions are a bit vague. I found this tutorial that I'm hoping to use to finish up the fixed resistor part of the job. eclipse: ok, stupid question maybe; but howmany degrees goes this servo ? 360 (Not Continuous offcourse) or just 180 ? It's working fine for 180 degrees. is there any tutorial available ?? is there any references that are useful to get these things working? tutorial or datasheet? ok, stupid question maybe; but howmany degrees goes this servo ? 360 (Not Continuous offcourse) or just 180 ? Same question as I2C Master, have these been modified to do full rotation? And if not (which is what I'm hoping), what is the angle range between 0.9ms and 2.1ms (or whatever the timings actually are)? Same question, except I want these to be full rotation, and I want an ANSWER!!!! When e-mail comes to town, ya-know-ya-know it's like a rain-storm. In your brow-ser. Homestar Runner FTW! Ask a Ninja's good, too. I've learned to ask SparkFun for answers now, and I'm glad I did! Also, I JUST realized (what is UP with me always realizing too late?) that sbemail could refer to things other than the Strong Bad Email Webtoons. Does it refer to that? I'm sorry to hear about that. We rarely hear of any problems with these servos, and we'd be happy to help troubleshoot why yours aren't working, or get you replacements. Drop us an email with as much information as you can. It appears that they do both infact work. It turns out my power supply was not strong enough, and the microcontroller kept resetting! Ive beefed up the PS and it works now. sorry for the confusion! PS: is it normal for them to get warm after a few minutes of scanning back and forth without load? Thanks for the help, and again, sorry, it was my mistake. How do I put the servo together? What should be connected to what parts? The screws are for: 1 for mounting 1 for attaching the attachments to the actual servo 1 I have no Idea. In addition, the black pin goes to GND, red to PWR, and white for a signal. I build Raspberry Pi pan and tile cameras with two of these servos. They work great, are light weight, and don't cost much. It has a hard time staying in position, it's shaking out of control rendering it unusable. I got 4-5 of these, and they're good for prototyping. If you want to make high-quality products you may not go here (and there are higher quality options in here). As usual you'll have to experiment with the pulse width to map the full range of motion, and don't go too high or low or it will keep forcing against the hard limits. For some reason I've fried one of mine so that when I power it on it just pushes against the limit and does not respond to any valid input signal anymore, but it was probably my fault. Get a few of them and experiment with them. It was easy to hook up and easy to control. At times, there is some chatter but this is common for servos. the rotation only hits about 160 degrees but that was clearly stated. I was using this for some simple projects with my kids. It worked the first 3 times, and then was like watching a dying insect sort of jerking around. I think I'll spend a little extra cash on a better one next time. One of them burned out really quickly but the other two ended up being decent enough and the right choice for the pan/tilt bracket they are attached to. I'm just learning to use servos in projects and this was a nice, inexpensive way to build a little pan-tilt project and not worry about breaking my bank account if I broke the project. Servo jitters severely around 0 position and makes lots of noise. Also the terminals and wire seem a bit flimsy. I would trust this servo in $5 pan tilt bracket but NOT in a $200 model airplane! Hi, Sorry about the issues. If you need a more reliable servo for high value projects, I would recommend a higher grade servo such as the HiTec servos. They are much more reliable than the generic servos. 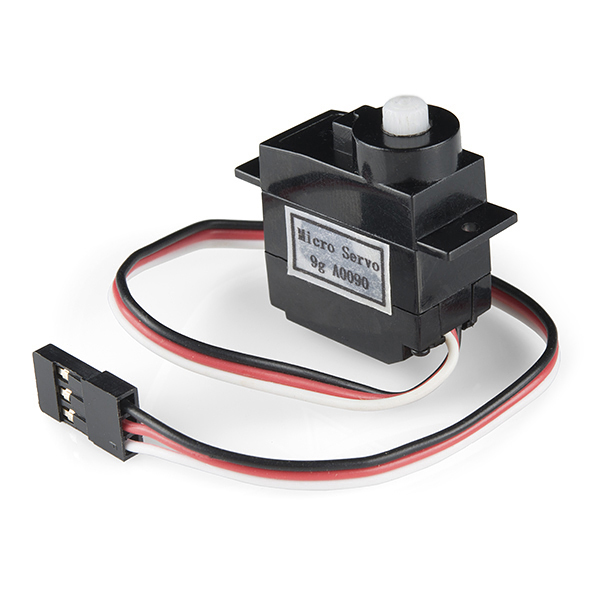 But the generic servos are great when you need a low dollar servo for your applications. Thanks for the feedback!